Parts one and two covered Amelia Jane, the Famous Five, the Adventure Series and Malory Towers. Next I’m going to blether about the Secret Series, the Galliano’s Circus Series and the Adventurous Four. I’ve always liked the Secret Series, though if I had to put the major series in order it’d be probably be fourth just after the Adventure Series and Malory Towers, and slightly above the Five Find-Outers. I had all five books when I was younger, all in paperback. The first four were matching Armada paperbacks that had belonged to my mum, and I assume the fifth was too, but it’d suffered some sort of mishap along the way and was instead of a proper cover it had one made of blue and white patterned paper. It was nicely done but unfortunately I can’t find it now to take a picture of. They were all illustrated by Dylan Roberts and although I can’t recall what they looked like I’m sure I found them perfectly satisfactory as a child. The covers were all by Mary Gernat (a name I recognise from Six Bad Boys) and looking at them now they all remind me very much of the characters and stories of the books within. Given the consistent format, covers and internal illustrations of the first four there is nothing to influence my preference except for the actual stories. Perhaps interestingly my order of preference for all five books is the same as the series order, and I actually doubt The Secret of Moon Castle is my least favourite simply because it lacked a cover. The first editions of the Secret Series are somewhat unusual as they had four different illustrators (E.H. Davie, Harry Rountree, Eileen Soper and Dorothy Hall) over five books. A few other series have multiple illustrators but each did several books (the 15 Five Find-Outers had three illustrators: Joseph Abbey, Treyer Evans and Lilian Buchanan, likewise the 15 Secret Seven books had three illustrators: George Brooks, Bruno Kay and Burgess Sharrocks). I wonder if I’d first read early editions with the four illustrators, would that would have influenced my preferences? 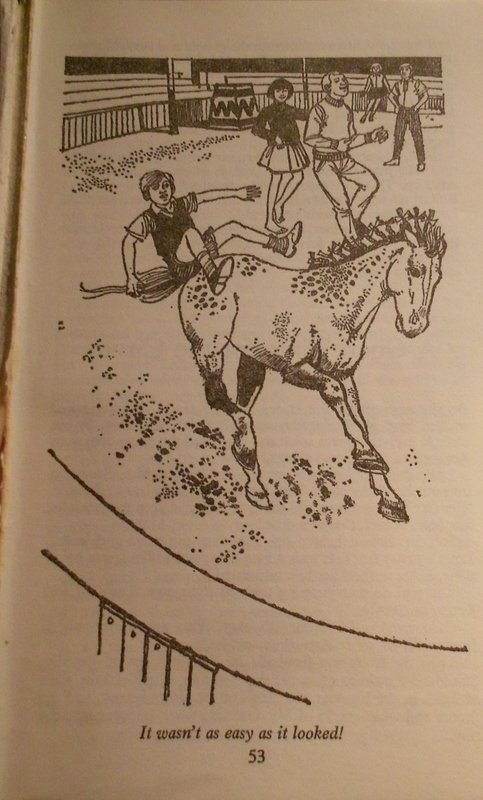 Eileen Soper is my favourite illustrator of Blyton’s works, would that have pushed Killimooin up my list? Sadly, I will never know. I really enjoyed the Galliano’s Circus series as a child, though I always felt there was something missing. As an adult, I figured out what that something was – the middle book of the series! 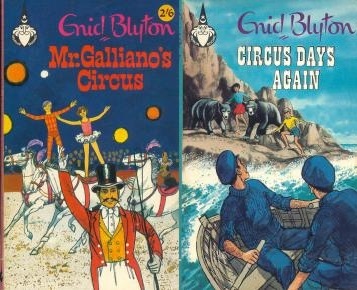 I had the first book Mr Galliano’s Circus and the third book Circus Days Again, but I was missing Hurrah for the Circus! All the Blyton series I can think of are written so that each title is a complete story in its own right and can be read, and enjoyed, on its own – though they are best enjoyed as a series. I certainly enjoyed the third book from the series, but I remember always thinking I’d missed something, somewhere, which had me checking the first book to see if something was mentioned that would explain it. Of course as soon as I looked it up online I realised I was missing an entire story, and everything made so much more sense when I bought all three in hardback and read the whole series in order. Merlin paperbacks with illustrations and covers by Clyde Pearson. As seems to be a running theme with me I can’t remember what Clyde Pearson’s illustrations were like, but fear not, I have the paperback to hand (well, most of it, pages 21 to 52 are mysteriously absent). I’ve made a quick decision, his illustrations are strange. Not terrible… just a bit odd. Here, see what you think. See? I mean, just what is that chap in the background doing? In my opinion E.H. Davie’s illustrations are much better and are, of course, very much of the time the books were set. You can see all of E.H. Davie’s rather lovely illustrations in the Cave of Books, just click any title, scroll to the bottom of the page and click “reload page to show illustrations”. As you just read all of two seconds ago, I had the Merlin paperbacks which were illustrated by Clyde Pearson. 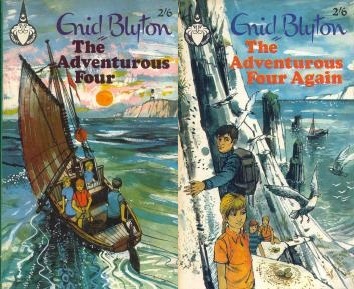 I liked both books in the Adventurous Four series, though I think I liked the first book more than the second. The first was a bit more exciting and slightly more original – the second book is a little like the first only on a different island. Assuming Pearson’s illustrations for this series were similar to those he did for the Galliano’s Circus books I can’t imagine they were particularly good – though I don’t recall thinking they were bad as a child. Like the Galliano’s series the original illustrator was E.H. Davie and I do like her illustrations in the copies I now have. We’ve reached the end of this trip down memory lane (though there’s another 4 or 5 to go!) so I’ll finish up by asking if any of these editions are/were part of your library – and if so, what do they mean to you? This entry was posted in Personal Experiences, Purchases and tagged Armada, Clyde Pearson, Dylan Roberts, E.H. Davie, Editions, Eileen Soper, Illustrators, Mary Gernat, Merlin, Mr Galliano's Circus, My Childhood Books, The Adventurous Four, The Secret Series. Bookmark the permalink.